Maybe I am not very human – what I wanted to do was to paint sunlight on the side of a house. I awoke Saturday to a 55-degree windy morning, but was excited to have a clear calendar for plein air painting. 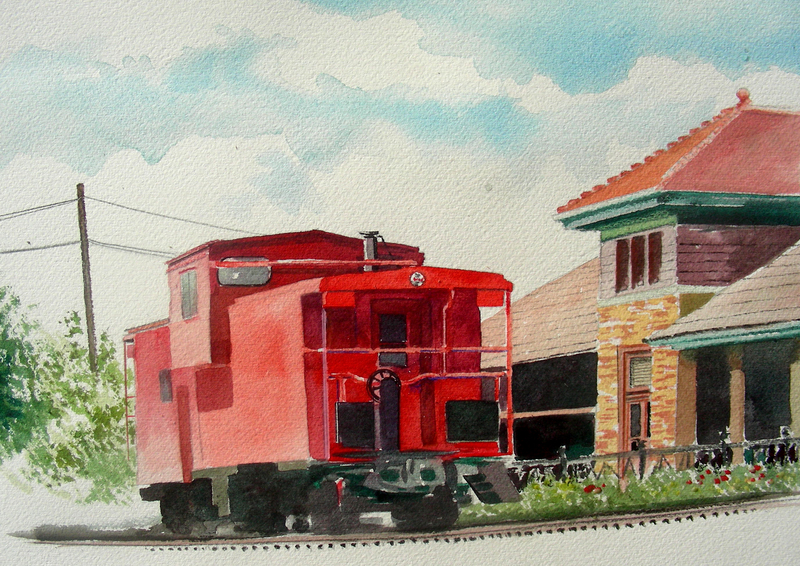 Paint Historic Waxahachie is now in full swing, and will end on May 14. 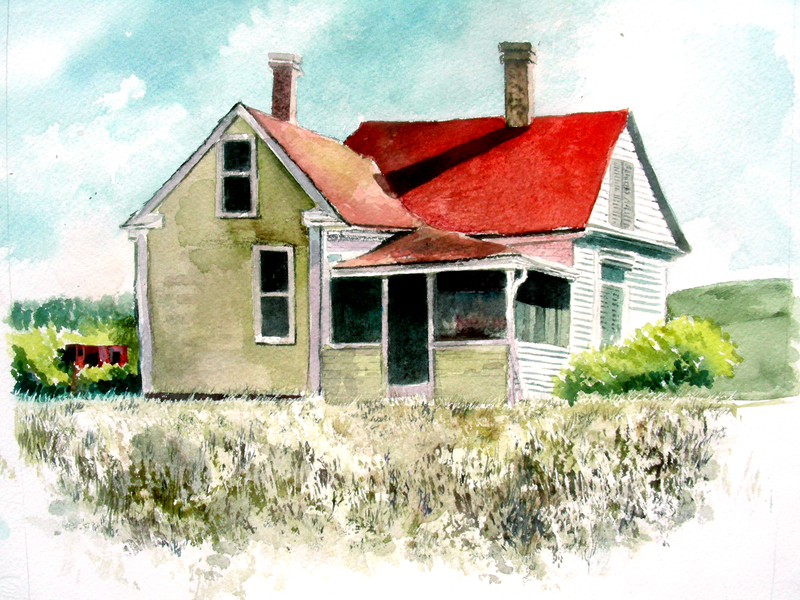 I have been eligible to participate since April 1, but have been mired in too many retirement-and-tax-related tasks to make the forty-minute drive to this quaint town and begin painting. This was my first day to get after it. With a hot cup of coffee and three layers of clothing (shirt, hoodie and denim jacket), I set up my easel just off College Street and resumed a plein air sketch I had begun last week, but was aborted because of a heavy rainstorm. My motivation was high, and the building on my right kept the wind from reaching me. And though I was working in the shadows, pedestrians were still finding me and stopping to look at my work in progress and chat. Waxahachie has always been filled with the friendliest people, and I have enjoyed the pleasantries of their conversations without fail. I have never felt like a stranger in that town. I decided to stop and let the painting rest at this point. I can always set up the easel in the same spot and work further on the composition if I choose. But for now, I’m going to move on to other ideas and return to this with a critical eye next time I visit Waxahachie. Stepping into the sunlight on College Street, my sight was arrested by the bright morning sun on the light yellow upper balcony of this building, framed against dark rustic brick and trees. I could not stop gazing at it and thought, “Oh, why not?” Setting up my easel, I drew for quite awhile, trying to get the proportions of the balcony and building right. By the time I began painting, my teeth were chattering as College Street had become a virtual wind tunnel for those freezing blasts of arctic air. The temperature had only risen to 57 degrees and my coffee mug was empty. Nevertheless, I tooled away on this composition for awhile, enjoying the view immensely, though the discomfort of the cold winds continued to intensify. Finally, around twelve noon, I had to stop. I was afraid I would make myself sick in the cold winds. This one also I am not satisfied with as a finished composition, so I intend to put it back on the easel when I return to Waxahachie for my next plein air attempts. The beginning and end of all literary activity is the reproduction of the world that surrounds me by means of the world that is in me, all things being grasped, related, recreated, molded, and reconstructed in a personal form and original manner. My Saturday seemed to apply Goethe’s theory of writing to painting. 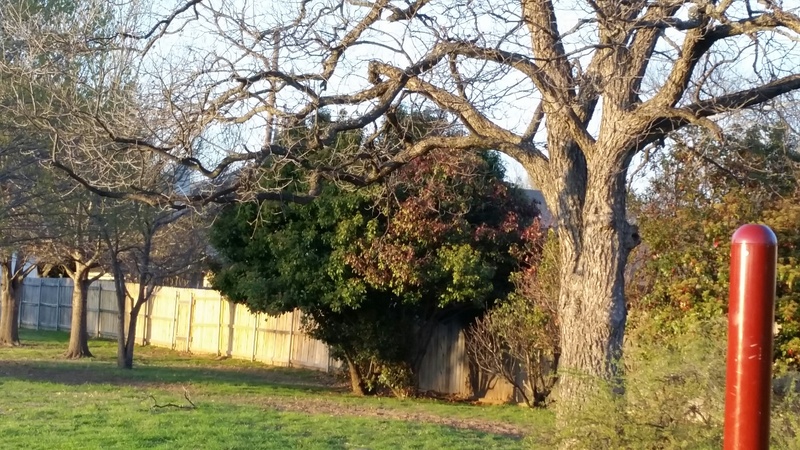 While moving about Waxahachie, certain sites I viewed resonated profoundly with certain emotions and memories I have treasured throughout my life. Every time I set up the easel and got out the tools, I felt that I was engaged in a dance with the subjects before me, and I hoped that my responses on the blank page were worthy of the beauty my eye beheld in front of me. And finally, I’m bringing this limited edition back out for the weekend show at The Gallery at Redlands, 400 N. Queen St., Palestine, Texas. It is priced at $80. Spencer’s Grill is located on Kirkwood Road (old Route 66) in St. Louis, Missouri. The business has been there since 1947, and the colorful billboard that advertised the place caught my eye since the days I was too young yet to read. Nearly every time I visit my family in St. Louis, I go to this establishment for an old-fashioned breakfast, seated at a counter stool, feeling that I have entered Edward Hopper’s painting Nighthawks. I guess I will always be a painter of memories. The blank canvas is the blank page. You start with nothing. It’s hugely provocative. It’s frightening because you may have too much to put on it. Or not enough of yourself. This cool, dark, overcast, rainy Saturday morning put me in the mood to continue a watercolor I worked on last evening. I’m getting close to finishing it. While painting, I like to listen to some kind of creative stimulus, often spinning LPs on my turntable, or using the laptop to dial up a YouTube presentation. Choosing the latter, I was shocked to discover a nearly hour-long documentary on Edward Hopper titled “Edward Hopper and the Blank Canvas.” What jolted me after all these years was to discover how much film footage remains of Hopper’s television interview with Brian O’Doherty. The presentation is very engaging, and filled with plenty of interviews with film maker Wim Wenders (who was deeply influenced by Hopper’s scenes and collaborated with his photographer to re-create many settings reminiscent of these paintings). The above quote from Wenders is still working on me as I pour myself into this most recent painting. Eureka Springs is the setting, and their historic railroad depot provides a lengthy section of abandoned trackage where derelict rolling stock has been parked. Every time I visit the town, I love to stroll the length of these tracks, taking pictures and making sketches of the rail cars. As I painted this afternoon, watching my blank paper slowly develop into a painting, I felt the sweet memories of last summer’s excursion flowing through me. Of course, I’m never sure if my feelings come out in the paintings (and Edward Hopper never knew, or perhaps didn’t even care, whether his thoughts were recognized by viewers of his work). I think what engages me the most, thinking of the Wim Wender quote, is when I should declare a painting finished, whether or not I have pushed my feelings far enough into the process. Of course, that is something I’ll never know. But I still think about it as I work. It is very well to copy what one sees. It’s much better to draw what one has retained in one’s memory. It is a transformation in which imagination collaborates with memory. Finally, FINALLY I am afforded the opportunity to return to the studio! I’m in my third week of a new school year and have managed to do plenty of pencil sketching in my journal the past few days, but I have had an uncontrollable itch to pick up the watercolor brush. So, when I saw a gap in my schedule this afternoon, I charged full-bore into a 20 x 24″ stretched paper surface and have felt such a rush of eudaimonia throughout this afternoon and evening. My subject I recognize as an abandoned filling station I photographed this summer, I believe in the vicinity of Brookfield, Missouri on Highway 36. About a month or so ago, I did a small watercolor of a brightly-colored restored gas station further east along that same stretch of highway that friends had pointed out to me. My current project will have far less color, just a white frame building with all its signage and pumps removed. Still, the sprawling highway alongside the abandoned structure has such an Edward Hopper kind of feel, and I have always loved his painting titled Gas. Most viewers with whom I’ve spoken are fascinated with the solitary man at the pumps. As for me, I’ve always been more interested in the white frame building, the pavement, and a dark forest framing the composition. When I drove across Missouri last summer and saw the remains of that gas station to my right, I knew I had something very near to my recollection of a Hopper composition. The evening has also been delicious because of the quiet time and space to work on my art history for tomorrow. With each passing day, I am getting more attached to my students in the three A-Day art history sections. I am trying something new this academic year, and so far I’m pleased with how it is working. For about four years now, I have been hammered by “experts” that collaborative learning is the wave of the educational future, and that we should be forcing the students into such groups to enhance their learning. This is completely counter to the way I learned during my significant years, and cuts against the grain of how I am comfortable teaching. I have heard the scoffers ridiculing the lecture format, referring to it as the Dark Age of schooling. I couldn’t disagree more. For one thing, when I lecture, I continually throw questions out on the floor to engage students willing to engage, and for the most part they are willing. Last year, I almost completely abandoned the lecture format in favor of group learning and discussion, and I found the year among the most dissatisfying in my nearly three decades of experience. This year I have compromised, working earnestly to cut each ninety-minute class period into collaborative portions, in additon to lecturing portions as well as time for independent work with chrome books or smart phones. Each session still has a thesis, and I don’t lose sight of the goal. But I am very pleased to watch how these classes have developed. For instance, in my last session, our focus was on early dynastic Egypt, and we studied three select sculptures from the day’s unit. And as the three figures were examined, I sought a healthy balance of independent computer research, group collaboration and lecture. And once the ninety-minute period was completed, the students not only were exposed to the historical background and technical vocabulary of those three pieces, but when prompted by me to connect with what they had worked on during the first two weeks, there emerged from the discussion allusions to the Archaic, Classical and Hellenistic eras of Greek art, along with ideas from Heraclitus, Parmenides and Plato. In further discussion, ideas were dropped as well from the lives of Isaac Newton, Steve Wozniak and Steve Jobs. That provided quite a rush for me, and I hope it did for them as well. It’s been a great week, and I’m so pleased to be making art again. Thanks for reading. I see in painters prose writers and poets. Rhyme, measure, the turning of verses which is indispensable and which gives them so much vigor, are analogous to the hidden symmetry, to the equilibrium at once wise and inspired, which governs the meeting or separation of lines and spaces, the echoes of color, etc. . . . But the beauty of verse does not consist of exactitude in obeying rules, when even the most ignorant eyes see at once any lack of attention to them. It resides in a thousand secret harmonies and conventions which make up the power of poetry and which go straight to the imagination. In my art history classes, we are neck-deep in the opposing theories of the Neoclassical and Romantic painters of the 18th and 19th centuries. I never really know just how much of this content (if any) resonates with my students, but it makes my blood pump hotter, and quickens my pulse. This debate is not merely academic with me, as the personal matters extend all the way back to my college days over forty years ago. In those days, I was tagged as Neoclassical, though they used a different vocabulary to describe my work then. The debate divides painters between the drafting, compositional, structural ones (Neoclassical) and the painterly, organic, emotional ones (Romantic). I have always been tagged with the former–I draw, I structure, I try to discern rules for quality compositions when I make art. 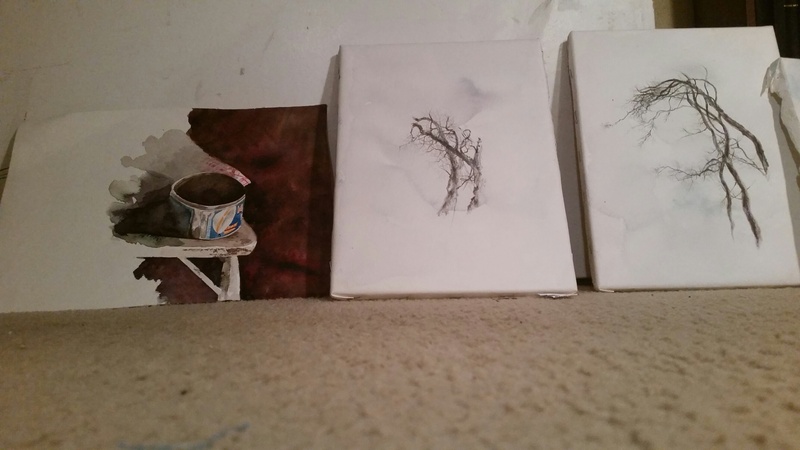 My college professors said my oil paintings were “colored drawings.” They were right. In the ensuing years, I have found my niche in watercolor because I regard this medium as an extension of drawing, and it feels natural to me. But now in my senior years, I feel things more deeply, embrace beauty more passionately. And when I regard my own work, I continually wonder how one finds the key to creating art for an emotional response rather than a rational one. I find some comfort in reading that Andrew Wyeth and Edward Hopper struggled with the same sentiments. They feaered that label of being “illustrators” and “technicians” rather than artists. When I took my exercise walk this evening, I was held by the attraction of this magnificent tree glowing in the setting sun. 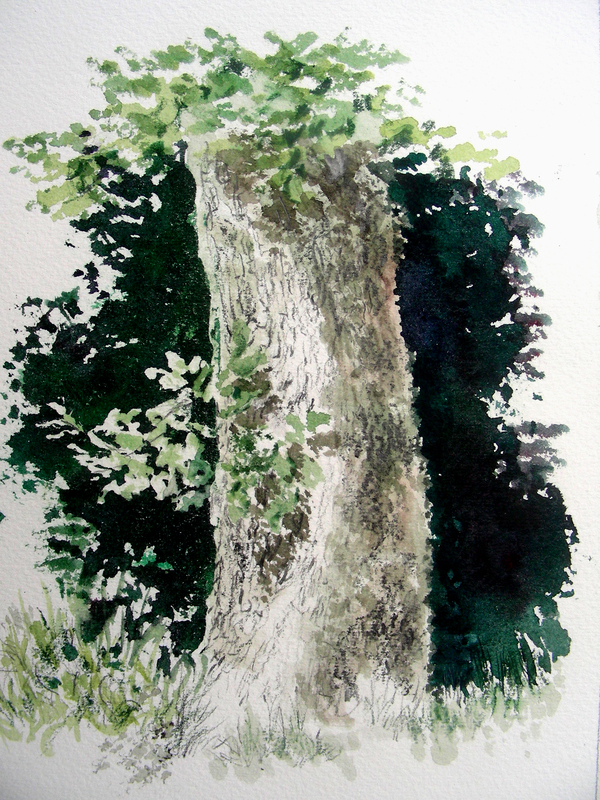 As I gazed at it, charged with emotional energy, I thought of my own recent attempts to render trees in watercolor. And I wondered what it would take to raise the quality of such paintings from the standard of illustration to one of beauty. How could I learn to paint trees with a druidic feel, rather than illustrative, such as one finds in an encyclopedia? My apologies if this entry comes across as rambling. But this is where I am tonight, and I’m fascinated with these conflicting notions that have coexisted in the art world for centuries. I feel that this award was not made to me as a man, but to my work–a life’s work in the agony and sweat of the human spirit, not for glory and least of all for profit, but to create out of the materials of the human spirit something which did not exist before. This morning when I read these words from Faulkner, I felt his nod of affirmation toward anyone who tries to create. The moment class ended today, I bolted for my studio so I could give this plein air sketch begun yesterday afternoon one more push. As I worked over the details, I thought of all artists, musicians and writers–those who try and seize those impulses in their consciousness, mull over them, and then give them some kind of recognizable form for others to see and feel. The feelings I’ve known while gazing at the side of this tree in my backyard cannot be expressed, but at least I can leave a record behind of my moment in its presence. Why merge disjunctive spirits as Shakespeare and Hemingway? And why as artificer absorb the works of artists Robert Motherwell and Edward Hopper? How do these disparate spirits conjoin? They focused on the sere, rudimentary elements as they composed: words, colors, strokes of the pen, pencil and brush. Erasing, effacing, distasting, they urged themselves on and on and on, never ceasing to believe, never ceasing to love. Penetrating beneath the visible stratum, these excavating spirits focused on the underlying foundation, der Grund. And, rising above this foundation, they erected their structure of words, drawings and brushstrokes, connecting the elements with strong yet supple tissue, allowing the composition to flex into its desirable form. Cleaving between warms and cools. Prufrock’s indecisons, visions and revisions. Hopper identifies my style, but Motherwell shapes it, reminding me that two marks cry out for a third, and then the triad wants a fourth, and so on. Cezanne also prompts me: the world is complicated, so the purpose of composition is to make the world less complicated. He wanted to astonish Paris with an apple; I want to astonish my contemporaries with a caboose.